In a move I strongly support, the new American health care bill includes the provision of chain restaurant calories at point of sale directly on the menu boards. Sure it'll preclude tougher State based laws but all told, this is a huge step forward for calorie awareness and for folks who might be trying to track their caloric intakes. I've never really understood why it is that so many folks think calorie counting is difficult. 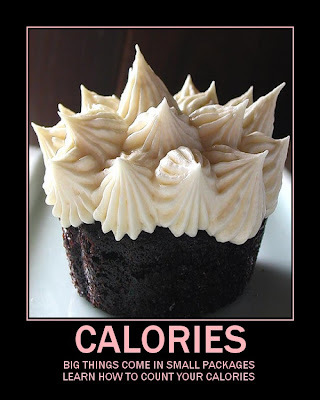 I'd like to make the argument that counting calories is easy, though accuracy can be difficult. Before I get into the how of counting calories I'd like to talk about the why. As I've said many times before, calories are the currency of weight. If weight's a concern to you, whether the concern's to gain, maintain or lose, caloric intake is certainly the most important factor for you to consider. The problem of course is that calories aren't visible or intuitive and simply looking at a food or a meal doesn't tell you anything about its calories. If you wouldn't consider shopping without looking at pricetags, I'd argue you shouldn't consider eating without looking at calories. There is some good news. There's more caloric information available now than ever before. Whether it's a calorie counting book, a website, the product's package, the restaurant's nutritional information webpage and thanks to the new US health care reform bill all American chain restaurant menus and apparently even vending machines, it's not tough to find calories. There's also umpteen different means to track. From hardcopy food diaries, to free online services such as Sparkpeople, to iPhone, Android and Blackberry applications, to Twitter as well as cheap recipe analyzing programs such as Mastercook 9.0. Regardless of the way you go about it, I'd argue on a terrible day tracking calories will take you 20 minutes of effort and that once you're good at it, that effort likely won't exceed 5. Why? People are pretty boring. We eat the same foods over and over again and once you've learned the calories in your foodscape off by heart, tracking will take seconds. Two things matter in record keeping. Completeness and accuracy and they're different. Completeness means writing foods down as you go along. Studies show that if you wait until the end of the day to recall what you've had you'll forget stuff, and you won't think you did because that's what forgetting is. So I recommend eat something and write it down immediately. However for two reasons I'd recommend not looking the calories up until the very end of the day. Firstly time. It takes virtually no time to write foods down, but it does take time to look them up. I'd rather you wait until the end of the day and set aside 10-20 minutes to look things up rather than get frustrated flipping through a calorie book all day long. Secondly because I don't think calories should be treated as a ceiling. Thinking you've only got a few hundred left for dinner is a diet and while indeed I think it's important to learn from your choices, I don't want you to feel blindly restricted and end of day addition may prevent you from getting too hung up in "what's left". Food diarizing is about guidance, not judgement. Accuracy's the other thing I mentioned. Scales, spoons, cups - they've all got to be employed, but do remember they're there to tell you how much you had, not how much you're allowed. You're the boss, not a cup. People seem extremely comfortable with the notion that to lose weight successfully they'd need to spend a bit more time exercising, yet many of those very same people who are willing to find 30 minutes a day to exercise seem to be hesitant to spend 5 minutes a day scribbling in a book. That's a shame because those 5 minutes of scribbling, so long as it was both complete and accurate, would likely have a far greater impact on their ability to manage their weight than the gym would. It's easier to lose weight with pens in kitchens than in gyms with dumbbells though of course ideally you want to try to do both.